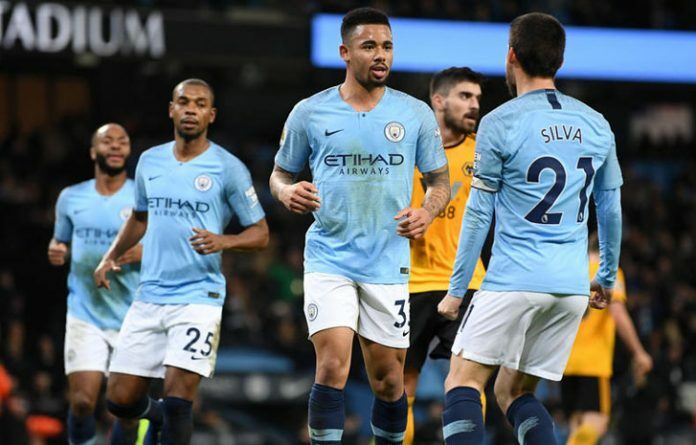 Gabriel Jesus took his tally to seven goals in three games with a double as Manchester City beat 10-man Wolverhampton Wanderers 3-0 to cut Premier League leaders Liverpool’s advantage to four points on Monday, according to In.reuters.com reports. After back-to-back league defeats during the Christmas fixtures, City have now won five matches in a row in all competitions, racking up 24 goals in the process, and look primed to give chase to Juergen Klopp’s Liverpool. “We have played a lot of time with 10 against 11 and we should be more aggressive in our attacking play, but we have a lot of matches in our minds and our legs,” City manager Pep Guardiola, perhaps disappointed not to boost his side’s goals tally further, said. City, who have now scored 99 goals in all competitions this season, knew only a victory would suffice after Liverpool’s weekend win at Brighton & Hove Albion and they needed only 10 minutes to go ahead at the Etihad Stadium. To their credit Wolves were diligent in defence after the break and restricted City’s chances although they did concede again when substitute Kevin de Bruyne whipped in a cross that glanced in off Wolves’ Conor Coady. Wolves boss Nuno Espirito Santo had no complaints about the red card for Boly who will receive a three-match ban. “Not only the red card changed the game, but the way we conceded with a long pass,” he said.